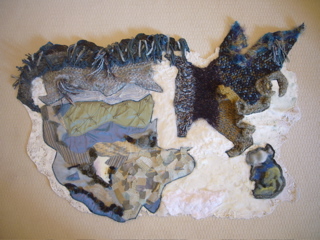 A series of global warming artworks by Madelaine Georgette, a global warming artist working in mixed media fibre. As an active and concerned environmentalist, I am currently working on a new series of global warming artworks that depict the impact of Climate Change.. While this issue is global, I chose initially to focus on impacts observed and experienced within the Arctic Circle. By focusing on the Arctic, I was able to narrow the parameters of this vast and complex phenomenon and, as I explored the effects further, I developed works on changes experienced in different parts of the planet. My artwork reflects the world around me and the subjects that move and inspire me. 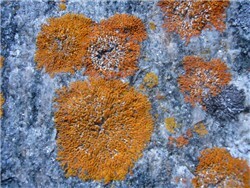 Art for me is communication with a language of shapes, forms, color, pattern and texture. In these pieces of global warming art, it is my intention to arouse and stimulate; to comment on this important issue, and, to simply delight the eye and feed the soul. Issues of connectedness and relationship between individuals and groups and between people and their environment underlie all my work. As a global warming artist, I work both visually and intellectually. I like to explore a subject through a series representing the different aspects of the subject as I experience, perceive and analyze it. 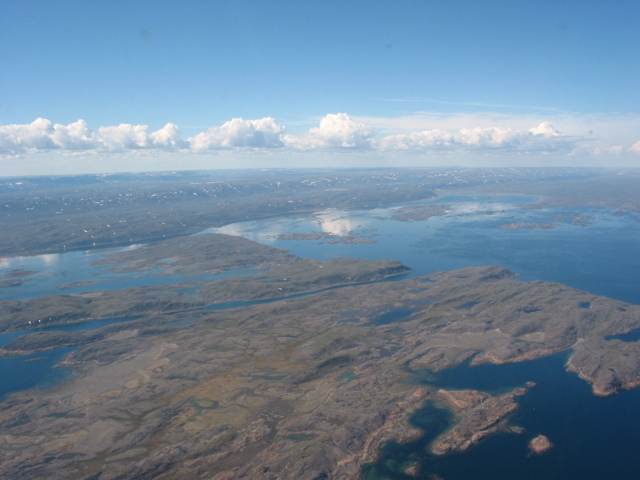 Motivated to see the actual effects of climate change, to immerse myself in the landscape and to discover the terrain, in July 2006 I went on an educational eco-expedition to Greenland, Labrador and Baffin Island to hike, sail and fly over this vast region of ice, earth, rock and sea - an amazing and thrilling journey. My perspectives of this landscape are many and varied. I saw it from the sky, hiked and climbed the terrain, examined the flora and algae, walked on some of the world’s oldest rocks and held tiny flowers between my fingers. 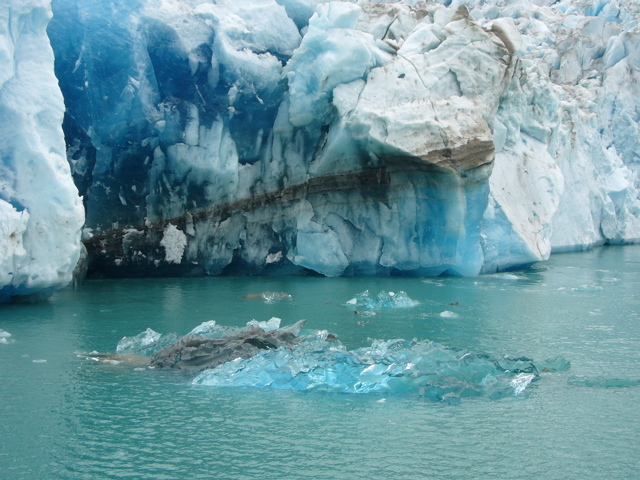 The frozen and often thawing tundra captivated me. Please visit my Itinerary page to view details. These global warming artworks represent a synthesis of my experiences in the Arctic and interests in and concerns about the future of our planet. They contain a multiplicity of different perspectives simultaneously in each piece. My viewpoint moves in and out of the landscape but always from above. They map my body’s relationship to the terrain; I am not looking out at it, I’m grounded in it or floating above it. It’s vast flatness and virtually no sign of human presence for thousands of miles, make it at once incredibly distant and also very intimate. I move in and out of this space, at once attached and grounded, at once detached and unrelated. 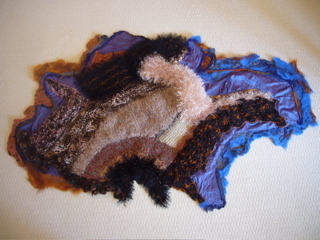 The pieces thus become metaphors for a state of being not unlike our connection to climate change and global warming - intimately connected to our environment and responsible and eager to assist in reversing a potential planetary disaster and simultaneously detached from the vastness of the problem and our feelings of impotence to effect change. Aside from personal expression and my passion for the planet, my goals are to increase awareness and inform and stimulate debate. I want to draw attention to the beauty of our fragile planet and arouse a desire in people to take personal responsibility for our human role in the causes of climate change and to motivate participation in solutions to arrest and ultimately reverse further damage to our environment. I started with the Arctic but have now expanded my vision and focus to look at different ecosystems throughout the world which are changing due to multiple factors including climate change. 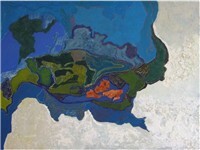 I began to look at the effects on water in urban areas and the effects of pollution on urban water sources and waterways; to depict changes in forests, primarily deforestation due to climate change, the introduction of new species of flora and fauna; invasions of insect species which destroy forests, etc. My attention is also drawn to issues and areas of desertification which is happening as areas dry out due to global warming, shifts in rain patterns, human activity that removes natural resources at a staggering rate and ecosystem change. 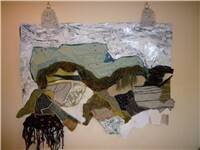 Please click on the following link to view works to date: Global Warming Art Exhibit. The artworks consist of two-dimensional, abstract wall hangings using raw, unstretched canvas thus freeing me from the restrictions of a rigid surface and rectangular format. It’s very important to me that the works have interesting, organic shapes and forms that are tactile with highly textured, rich surfaces. 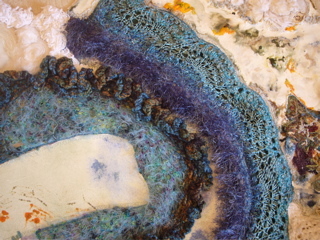 My methods of working have undergone a large change from almost exclusively oil painting to now incorporating new materials and new methods that combine my life-long interests in and involvement with painting, knitting, textiles and fibers. 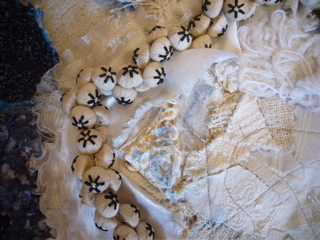 The materials include fabric, yarn, knitted sections, wire, beads, hand made clay forms, papers, found objects and painted areas. Natural organic materials are used where possible, as well as plants, bark and seeds. Sewing is both by machine and by hand. 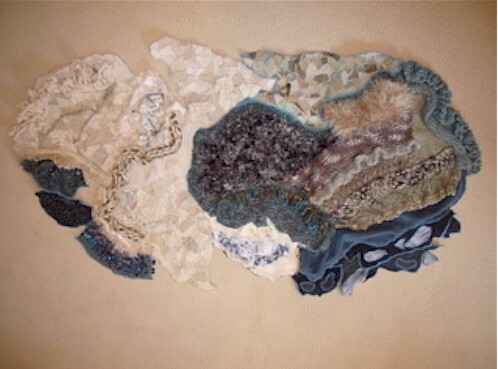 Many textiles and yarns are either natural fibers and/or hand-dyed. 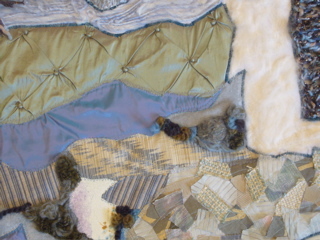 Click here to view Madelaine's studio.